It’s that time of year again. November 1st has come and all of the Christmas decorations are being put up one by one. Within the first two weeks of November, almost all of the Christmas decorations will have been put up by most of the shops and Christmas songs will be playing in almost all of the shops. As in the past two years, I have mentioned that Christmas is a time for couples, drinking parties, and then a change into the New Year season where we enjoy time with our families and a lot of shopping. It’s a great time of year, but one that has a bit of mixed emotions for me. This will be my fifth year in Japan, and the fifth Christmas away from my family. I have gotten used to it, but the fact that I don’t have a Christmas tree, nor will I exchange presents makes it a little sad. In the last year, I have learned a few new things about Christmas in Japan, and I have seen things change slightly each year. It appears that each year brings with it new traditions. Many children receive gifts on Christmas, but this usually stops around the time they enter school. Some friends will continue to give gifts, but this usually stops by the time they enter college. Unfortunately, the true meaning of Christmas is completely lost on most Japanese people. I have had conversations with various people about Christmas, and they tend to be surprised that in Canada, even non-Christians celebrate Christmas to some degree. The concept of Christmas is completely lost on them. While it is true that Christmas is currently a Christian holiday with Christian symbolism, I am constantly teaching them that the deeper meaning of Christmas is slightly different. I grew up in a Catholic family and raised going to a Catholic school. I had learned the Christian meaning of Christmas, but having grown up in Canada, I also learned the deeper meaning of Christmas. I prefer to think of Christmas as a time of family. It’s a time to get together and, similarly to Thanksgiving, give thanks to your family and show them how much you love them. I had mentioned that Japanese people tend to reverse Christmas and New Year’s, and it’s still very true. When I tell them this, many will understand for the first time, but many won’t completely understand. I find Christmas to be very easy to explain, but to understand it completely, it can be difficult. The commercialization of Christmas in Tokyo is very rampant. Wherever you go, you will see Christmas lights, Christmas trees, and various Christmas decorations. Unlike Canada and America, the huge sales leading up to Christmas are barely existent. It’s common to see a few sales, but due to the huge sales over the New Year holidays, it’s tough to put on big sales when people are waiting that extra month for the huge sales. In 2008, I mentioned the traditions of a Japanese Christmas. It was all about boyfriends and girlfriends. They go out for a date on New Year’s Eve and enjoy a nice Christmas cake. For families, or couples who have been together for a long time, it involves Kentucky Fried Chicken and a Christmas cake. Generally, the department stores are completely full on Christmas Eve, and there are long lines outside KFC. Many people pre-order their chicken and pick it up at the allotted time. It has never sat right with me. In fact, Christmas back home doesn’t really sit right with me as things are becoming over commercialized. In order to combat the lack of Christmas spirit, one of my favourite things to do is to watch a video commentary by Mike Mcartle, a local Vancouver reporter who does good will stories. He tells a good story on the meaning of Christmas and it has been running for years as a tradition on Christmas night. I hope you enjoy it, and if you want to enjoy Christmas in Tokyo, follow the links below for information. Note: These sites are only in Japanese. You can check each one individually if you can’t read Japanese. The three boxes are, in order, “There is a Christmas Tree”, “There is an event”, and “There are fireworks”. Unfortunately, the events will depend on the location, and I am not sure when the fireworks might be. Here is a bunch of locations that I find interesting. Unfortunately, they don’t usually change much over the years, especially now that the economy has been bad for the last few years. Things may change in the next few years. This Christmas Illumination is pretty big. 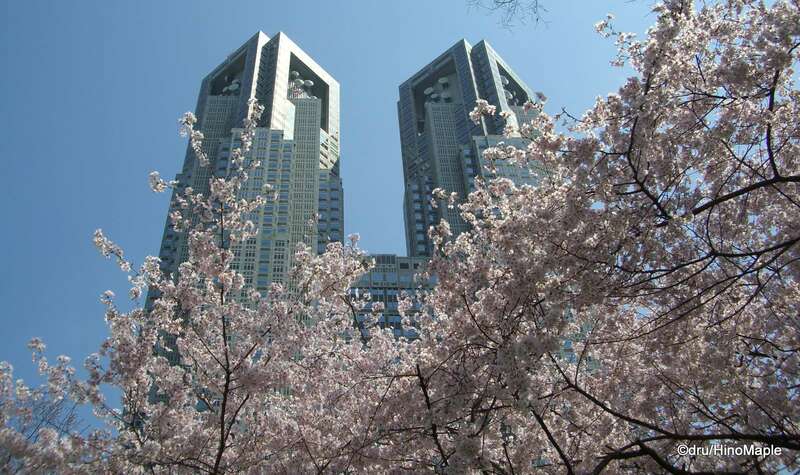 It spans several blocks and includes the various buildings in the Marunouchi area. Walking along Naka-dori or heading over to the Imperial Palace, you’ll see thousands of lights. Naka-dori also has various art sculptures. While the event is only for a week, the buildings along Naka-dori are still beautiful to visit during the season. This one is not as amazing, but the wave of blue is stunning. Be sure to go as a couple and get your fortune as a couple. This was popular last year, so expect a line if you do visit. 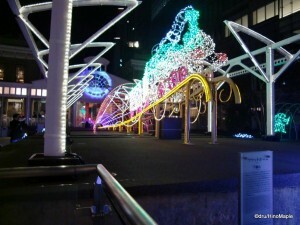 Be sure to also head towards the old Shinbashi Station building as they have a Christmas train made of lights. 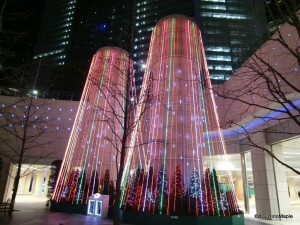 While the link is for Odaiba Decks, the entire shopping plaza and the various hotels in the area have many light displays. It’s still a couples location, but the tree is somewhat unique and the background is truly Tokyo. Both Roppongi Hills and Tokyo Midtown have vast displays. They have one of the best displays and they seem to add something new to it each year. Unfortunately, things haven’t really changed over the years, rather they just get larger. Along the west side, you’ll be able to see various lights at some of the building plazas, but the main action is along Shinjuku Southern Terrace. They have a huge display each year, but do be aware that it will be busy. 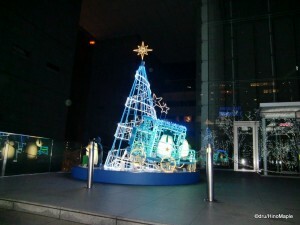 You can also visit Lumine for their roof top light display too. If you like high fashion shopping, a stop in Omotesando is a must. They have a large crystal tree inside Omotesando Hills and the entire street is lit up with Christmas lights. If I remember correctly, they were the first to start the Christmas light trend in Tokyo. The Showa Kinen Park is the only place this year with fireworks. There may be other places that are announced over the coming days, but so far, I haven’t heard anything yet. This entry was posted in Christmas and tagged Christmas, Christmas in Tokyo, Happy Holidays, Happy New Year, japan, New Year, New Year in Tokyo, tokyo by Dru. Bookmark the permalink.